Trixie (6) finished kindergarten last week. She loved her teacher, Miss K.C., so much that she wanted to create a piece of art for her. Miss K.C. 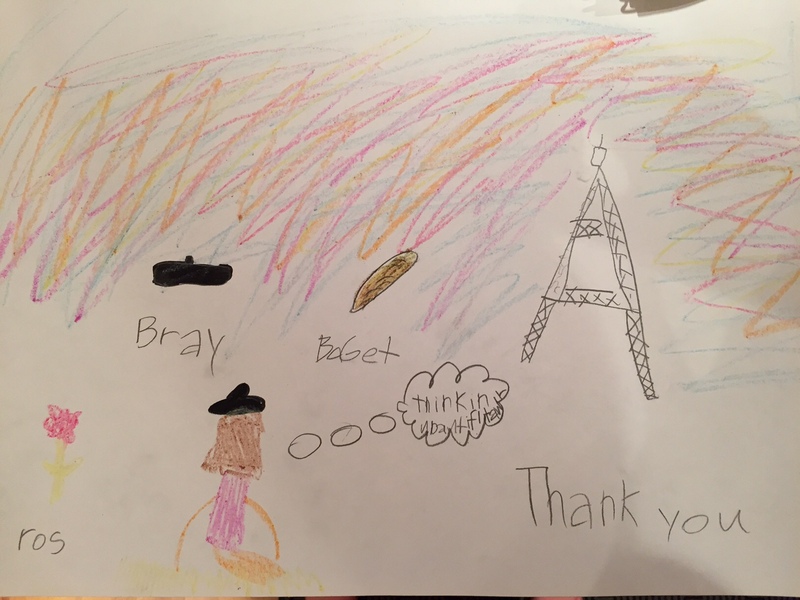 is a bit of a Francophile, which is reflected in this work depicting her staring at the Eiffel Tower, thinking about the Eiffel Tower (in thought bubble), and being surrounded by her oh-so-French accessories, a ros (rose), bray (beret), and baget (baguette, but you knew that). I love that girl’s imagination! Thanks for a great year, Miss K.C! P.S. While artwork is – of course – priceless, I loved Miss K.C. so much on Trixie’s behalf that I augmented the gift with a nice check to contribute to a real trip to Pair-ee. Bon voyage!